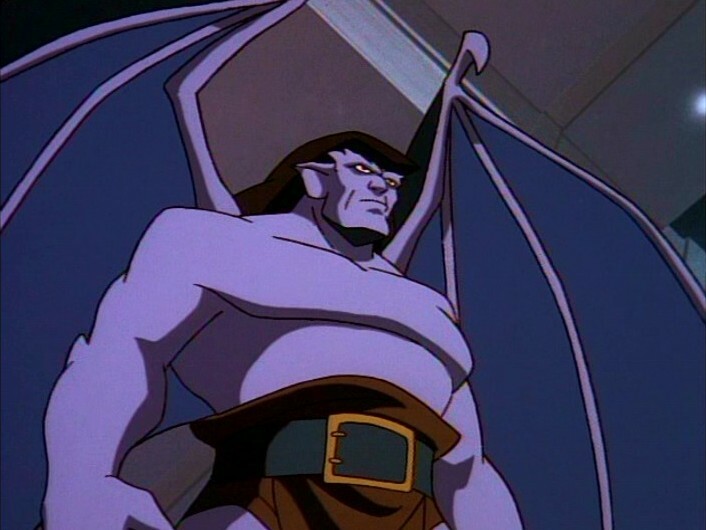 If you were a ‘90s kid, you spent your Saturday mornings revved up on a jolt of sugary cereal, wearing a bedsheet cape on your back and leaping on and off the sofa while watching the animated horror-slash-superhero series Gargoyles. Or at least I did. In this era of saccharine kids’ shows, there is something to be said about a bunch of gnarly medieval rock sculptures that spring to life after a thousand-year curse is lifted off of them when a billionaire tech tycoon relocates their ancient castle to the top of his NYC skyscraper. This evil alt-version of Tony Stark obviously wants instant bodyguards. Goliath (the only one who had a name before realizing he just woke up hundreds of feet above the five boroughs), Hudson, Brooklyn, Lexington and their gargoyle-dog Bronx battle betrayal, deception and evil X-Men while swearing to defend Manhattan. Gargoyles isn’t just a Gothic fairy tale. There is hidden magic where you’d least expect it to lurk in that crumbling castle and, later, the clock tower they stand sentinel at night after night, watching over the city that never sleeps. I had no idea I was picking up fragments of future required reading way before my time. Think references to Shakespeare, Dostoyevsky and Kafka (predictably during a cockroach encounter). Also, the rock-solid message about friendship and loyalty embedded into every episode is something no sparkling CGI fairies with their own Twitter accounts can do better. Did I mention the opening theme is nothing short of epic? You can’t leave the warped humor of this series in the dark, either. Merging ancient creatures with modern life is bound to cause some explosions—motorcycles or otherwise. Brooklyn is always looking for something with an engine to ride, and always ends up totaling it. Broadway devours everything edible in existence and spends his free time gorging on bags of butter-flavor popcorn in the attic of a movie theater as he watches the same Western over and over. Hudson would rather park himself in front of the TV. Lexington makes endless noob mistakes but totally redeems himself when he maneuvers a doomed helicopter through the congested city to the tune of Use the Force, Lex! Bonus points if you catch that one riff of the Star Wars theme as they plunge toward the concrete. Goliath ain’t got time for that. While Gargoyles has long since turned to stone, along with the rest of Saturday morning cartoons, you can now relive the awesomeness by binge-watching the Gargoyles TV YouTube channel. It does exist.